In most of our Davis textbooks and studio books, we talk about the ELEMENTS OF ART. One of the key elements of art is LINE. We can look at line not simply as a way of defining a shape, but also how beautiful line can be when it is in the form of the written word. Almost every culture on earth has elevated the written word to the status of art in the form of CALLIGRAPHY. Most of us are familiar with the beautiful calligraphy in Medieval and Renaissance manuscripts. But how many of you have ever looked at the numerous styles of Arabic script? Challenge your students to come up with beautiful scripts from other (non-western) cultures. You will be surprised at how easy it is to connect calligraphy from the past with styles in contemporary graphic design! “Recite the name of the Lord, who taught with the pen.” These are some of the first words to the Prophet Muhammad in the Qur’an. The importance of writing, which is emphasized throughout the Islamic holy book, led to the importance of calligraphy as an art form in Arab lands. Metalwork in Iran, especially that of forged steel, reached its greatest heights of sophistication during the Safavid period (1502–1736). Safavid metal artists produced significant innovations in form, design, and technique. Intricately incised surface inlay was brought to its greatest accomplishment, as was the carving of intricate patterns out of metal. This plaque was part of a decorative ensemble that adorned the royal tomb of Shah Suleyman II (ruled 1666–1693). It is a magnificent example of pierced steel, a very hard medium to master and control. The medium was pushed to the limits of artistic possibilities during the Safavid period. The plaque was probably formed from a forged piece of steel, openings being created with chisels, drills, saws, and files. Safavid artists preferred steel for openwork because of its durability and tensile strength. 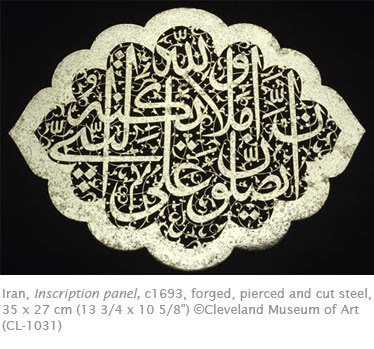 Although this work transcends any artistic accomplishment in metalworking in any Iranian dynasty or region, its stylistic formula is universal within the Muslim world: a verse from the Qur’an on a background of arabesques. The verse reads: “Verily, God and His Angels send blessings on the Prophet” (33.56). The artist of this piece successfully merged calligraphy and background into a decorative whole. Here is an interesting website about various types of Arab calligraphy.